Now, I know what you're thinking. "Man, Alice is so cool, I wish I had some Alice related stuff". Luckily for you, sites such as eBay exist where you can search and buy stuff digitally through the internet. The future is now people. But there's a lot of crap that pops up when you search Queen Alice's name. Double luckily for you, I picked out some of the more radder Alice related things so you don't have to sort through pages full of books (I mean, you should already own at least three physical copies of each) and skanky looking Halloween costumes (unless you want to). Here are my picks of the best Alice related search results from eBay, sorted by newly listed. Get your monies ready for after the jump. Sure you can probably walk into your local Disney store and buy some sort of Alice related plushies, but really, why would you want to. After the disappointment that was last year's Tim Burton imagining, I can't help but feel let down. I bet Disney Stores are packed to the brim with with cross promotional merchandise, stuff you shouldn't touch with a ten foot pole. Plus I bet they're covered in saliva from all the kids who are constantly hugging them because their parents have taste and don't want to purchase anything related to that travesty (except, of course, super sick New Era Alice Fitted hats). Well reader, hopefully you have some disposable income lying around. If you do, then maybe throw it towards a set of Funko Alice in Wonderland Plush Dolls. They look simple, but perfectly capture that Alice feel. 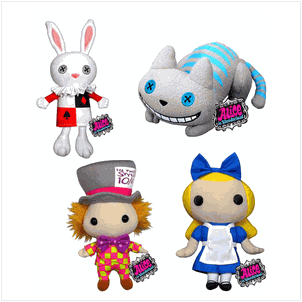 Plus look at cheshire, he looks so stoked to be a Funko plush toy. Goddamn. What's more classier than softcover books? Hardcover books. What's even classier than hardcover books? 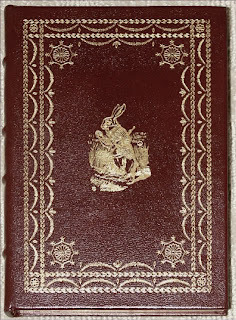 Leather bound ones. You want to spruce up your library and make it scream that you're an intellectual? Have a few rows full of these bad boys and people will swear you have a PhD, doctor. But this wouldn't be on one of those said shelves. 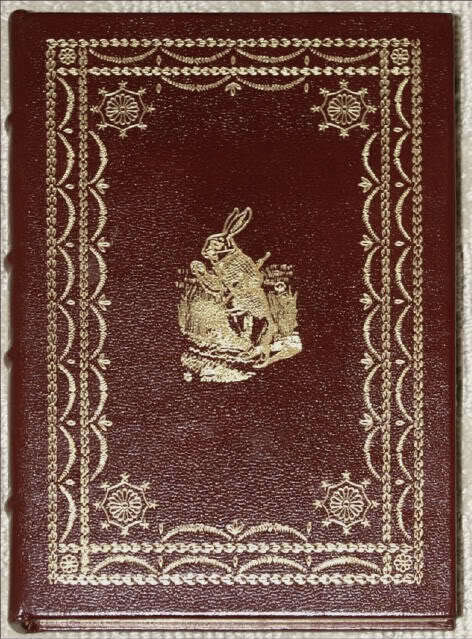 This is a leather-bound copy of Alice. If you purchase this you better give it the respect it deserves and put it in a glass case. You know, like the ones in museums. It should sit atop some sort of expensive pillow or book stand, and then be guarded by lasers. Talk about a centerpiece for your home. Say you're in your personal library, surrounded by shelves of leather-bound books. After reading Through the Looking-Glass for the sixty fifth time, you wonder to yourself if it's the appropriate time for tea yet. How ever will you go about finding that out? By pulling out your Alice pocket watch of course. Pocket watches are too awesome and add that extra pinch of class. If you're going to a formal and you don't have a pocket watch, you might as well not go at all. 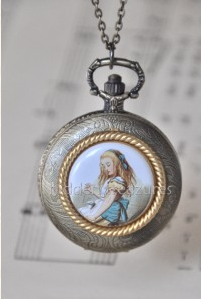 While there are more appropriate pocket watches for those situations, this one has Alice on it, a worthy reason for you to add it to your pocket watch collection. Pocket watch. If there's one real life person that perfectly captures the awesome that is Alice, it's probably Vin Diesel. I mean, before all your surface dudebroguymen publicly raped Chuck Norris facts, those actually belonged to the Vin man himself. You all should be ashamed. But it's cool. Vin doesn't mind. He's too busy racing cars around the world… or stealing them… or something? 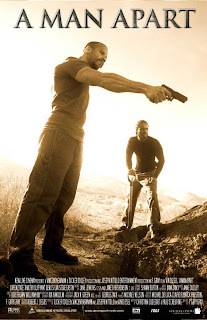 I'll be honest, I don't even know a A Man Apart is. What I do know is that this poster comes up when you search Alice, so it MUST be a sign. Who wouldn't want to display Vin Diesel holding a gun on their wall for everybody to see? Strategically place it next to a picture of something lame (say, like an 8.5x11 printout of Aurora, Jasmine or Rapunzel for example) and it looks like Vin is about to lay down some justice with a few rounds of hot lead. Blao. You remember the Brady Bunch right? Of course you do. I bet when you were watching, you thought to yourself "man, I bet whatever Alice just cooked tastes amazing!". Well now's your chance to experience some of that very Brady magic! 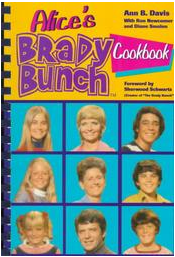 The publisher notes that it includes more than 280 Brady recipes. MORE THAN TWO HUNDRED AND EIGHTY. Talk about a very Brady value. If my use of caps lock hasn't sold you on this yet, look at the title. It's Very Good B. B. How can you not trust a title like that. This cookbook is down. Are you?